OS 10.6.8 I have just bought a new camcorder which came with an abridged manual. There is a comprehensive manual of 262 pages. I downloaded 100 pages and then ran out of paper. 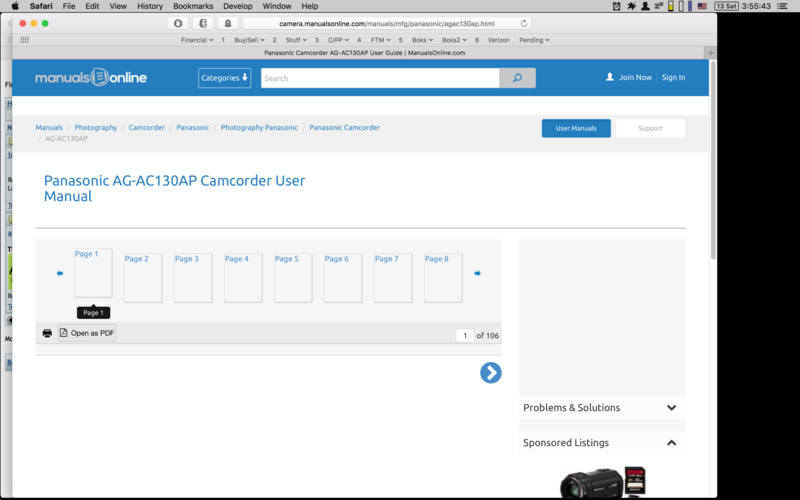 Problem is, how can I start printing at page 101? I believe there is software but I couldn't find anything. This is Panasonic's download and there is a progress bar which allows you to drag the page numbers to the page you want but when I put in what few sheets I had left, it started at the beginning. Anyone familiar with this situation? If there's a PDF that you can access, the standard OS X print dialog box will allow you to print pages 101 --> n.
More: A Google search turned up Free Panasonic Camcorder User Manuals, but since I didn't know which camcorder you've got I just clicked on several random ones and was taken to pages similar to this one, which displays both a "Print" icon and an "Open As PDF" link. Clicking on the icon got me a standard OS X print dialog box which allowed me to select whichever sequence of pages I wanted to print, and clicking on the PDF link got me a download that could be printed similarly. The PDF you need may be on the linked website, and if not, you may be able to find it by searching, and if still not, can you link us to the source with which you're having trouble? OS 10.6.8 I have downloaded the PDF (HC-WXF991k) hcwxf991.pdf and when I click the print icon, a window (brothers HL-L2360D printer) appears, and in the bottom right there is progress bar that allows you can drag a marker to the appropriate page number and then click print which I did but as I said, it started at the beginning. Maybe I'm missing something. I've found Panasonic HC WXF991K Manual Downloads, which I think is the manual you're looking for (except that it's 262 pages, not 247); the PDF it places on my desktop responds to command-P with a typical OS X print dialog box . If I'm on the wrong boat, I'm stymied without a link to your particular download. Is the print dialog box with the progress bar the same one you usually see when you try to print? If you have the PDF downloaded open it with Apple Preview. If a double-click does not open it in that application, control-click on the icon and choose "Open with…Preview". When you print from Preview you should get the standard Print Dialog, which allows you to select from the "Pages" option (the default is "All") a range of pages: "From…to…". Enter what you need. 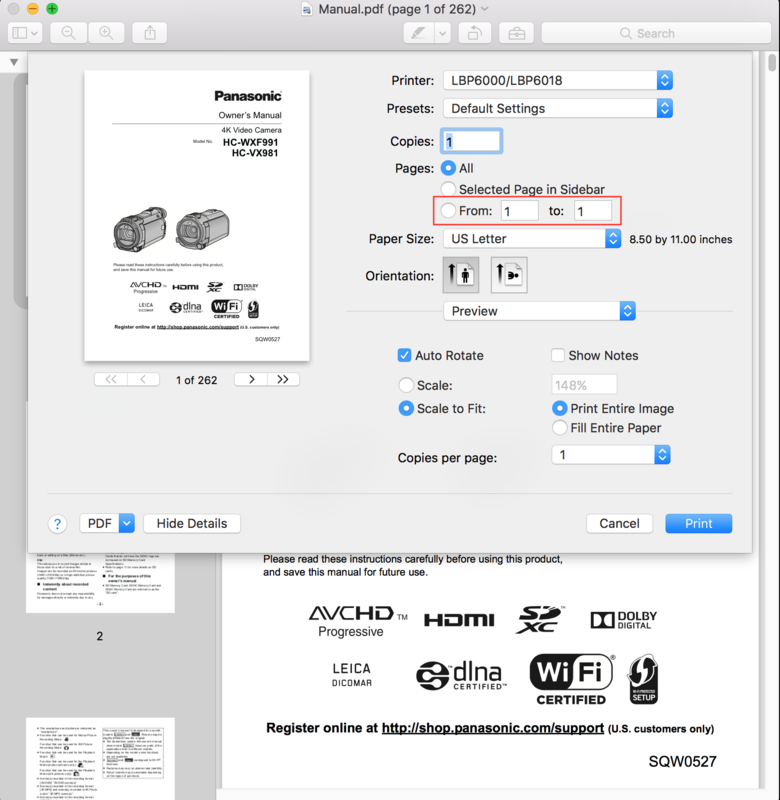 Before printing you might take a quick look at the PDF as it opened in Preview. The page numbering could be different from what is shown on the actual pages. Ira L, You got it right with open with preview. I went through the procedure without printing (no paper) and I think that will be ok. I will keep you informed. And yes artie, I was using adobe reader. Ira L, I printed the remaining manual pages today and it went well.Thank you for steering me in the right direction. Generated in 1.580 seconds in which 1.169 seconds were spent on a total of 14 queries. Zlib compression enabled.